Are you thinking about a career in instrumental conducting? We talked with several professional conductors to provide this list of 7 key issues you should be thinking about. 1. What to major in as an undergraduate? This is an important question for pre-college students, because conducting is not offered at the undergraduate level. Raphael Jiménez, associate professor of conducting and director of orchestras at Oberlin College Conservatory, recommends a strong performance background. “You should definitely be a strong performer and get as much performing experience as possible; so an undergraduate degree in performance is recommended. 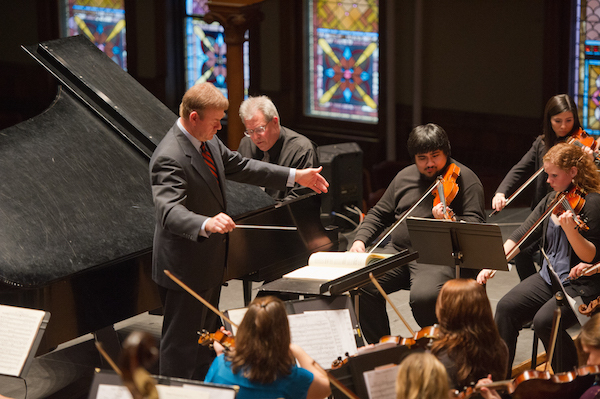 If you have a strong interest in conducting as an undergraduate, you should take courses in orchestration and composition.” Music education was also recommended by several professional conductors, since familiarity with every instrument and time in front of an ensemble is built into most music education programs. 2. What about summer music programs in conducting? 3. What are conducting programs looking for in prospective students? While there is no “magic bullet” answer to this question, Bradley Ethington, professor of music and director of bands at the Syracuse University Setnor School of Music explains, “Graduate conducting programs are looking for solid fundamental conducting skills and emerging advanced physical skills associated with the conductor’s art. A thorough knowledge of music theory and history, score analysis, rehearsal techniques, and the core repertoire in one’s field are prerequisites. Outstanding musicianship and academic excellence are essential.” In short: study hard, practice often, and in your pursuit of the physical technique do not neglect the related disciplines. Dennis Glocke, director of concert bands and conducting at Penn State School of Music says that a “willingness to learn” is also crucial, as are experiences that would help students succeed as teaching assistants. Franz Krager is a professor of conducting and director of orchestras at the University of Houston’s Moores School of Music. He believes that the right teacher is the “most important single factor” in finding the best graduate conducting program. He suggests traveling to take a lesson with teachers to get a feel for their style. Other conductors also recommend researching the kinds of conducting opportunities for graduate students at different schools, and making sure they are aligned with your future goals. 5. Is it a good idea to go right on to graduate school? A video recording of both rehearsal and performance followed by a live audition is often part of an instrumental conducting application. Some students are fortunate enough to attend programs and work with professors that allow them to develop such a portfolio at the undergraduate level. Some do not have those opportunities. Diane Wittry believes that graduate school timing is very much an individual decision. She explains that many people “don’t know what they don’t know” when they go straight on to their master’s degree from an undergraduate program. Students who take some time to gain experience separate from their college education often return more serious and studious. Yet at the same time, if the next step after their undergraduate degree is not going to help them develop as a musician, going straight on can keep the momentum going and be beneficial. Find as many opportunities as possible to get on the podium. You need to feel comfortable there. If you don’t find the opportunities you want, create them. Build an ensemble and book some performances. Attend as wide a variety of concerts as you can and as often as possible. Watch conductors and performers at every level and learn everything you can about high-level music making. If you do not already play the piano, start taking lessons. Be a well-rounded individual. Read books; learn about art; study philosophy, science, and history. Everything you learn provides a better context for your understanding and performance of a work. Do not be discouraged by the level you’re at –– every type of ensemble needs great conductors. Understand that a conducting career is about people as much as it is about the music. Be flexible, versatile, and willing to take on different roles. Conductors often hold multiple jobs concurrently. Be persistent. To succeed, you must want to conduct more than anything else. Experience and hard work are essential. Diane Wittry emphasizes that you should make whatever job you get the best you can. With an excellent product, people will notice you. “Go where the job is,” says Dennis Glocke, and Franz Krager reminds students that it is not just about the “art” of conducting: a conductor needs to also be a fundraiser, public speaker, and promoter –– and a visible, likable presence. Amy Mertz is a freelance writer who worked in admissions and community programs at the Syracuse University Setnor School of Music. She guided both undergraduate and graduate applicants through the admissions process, and also directed the Setnor Community Music Division. When college and universities hire band directors, is it better to have an M.M. in music education or wind/band conducting? Many college/university band conductors start out as music education undergraduates. Since there are many conducting programs for graduate students and since this is such a competitive field, we encourage you to look at graduate training in conducting to prepare to be a better fit for working in this field. You can use the “Find Schools That Fit Your Interest” feature on MajoringInMusic.com to learn about schools we work with that offer conducting. Check out their audition/submission requirements for grad programs in conducting. You can also visit the College Band Directors National Association website to learn much more about this field. I have a job that keeps me on the road 43 weeks out of the year. In the evenings, I find college and high school band and orchestra concerts to attend. It fills the soul with good music, and it gives me an opportunity to feel the pulse of the next generation–which I think is going to be just fine. If you want to see incredible conducting at a high school I have found in Plano, Texas, watch the following. Two things about this clip: 1) the orchestra (11th and 12th graders) is EXCELLENT, and the young conductor knows how to engage with the orchestra. Enjoy. (By the way, there are some excellent high school orchestras around the country.This one happens to be one that I never miss when I’m in NE Texas. Great to hear that you take advantage of attending these concerts – they’re a great free or low-cost way to experience quality music and the musicians who will keep the music flowing. Thank you for sharing! Is it possible or frowned on to get a Master’s Degree in instrumental performance, then get a DMA in conducting? There are several career directions you can go in as a conductor, and the necessary training and experience needed relates to the area of conducting you’re interested in pursuing. In general, to our knowledge, there is no single path to a career in conducting. You’ll see conductors with teaching degree backgrounds (helpful for understanding instruments other than one’s own plus pedagogical training) in addition to advanced performance degrees where they gain more technical proficiency plus more experience performing collaboratively in ensembles and orchestras. An advanced degree in conducting offers opportunities for mentoring from an experienced conductor with pedagogical training, language skills and (hopefully) communication and group dynamic skills training. And opportunities along the way to put all of this training into practice are essential. Thank you so much! This is very helpful and helps to build my confidence! Thanks for this important information. I agree strongly with Franz Krager. I add – learn several languages and explore the analysis of gesture begun by Hideo Saito. Great piece! A great conductor must ‘play’ the music with the orchestra as one voice. For up and comers it is important to practice constantly, and I recommend in front of a mirror in order to develop and perfect your technique. Also, watch and emulate the Masters at every opportunity. There is no substitute for having command of the score. My best to all who pursue this path! Very nice article! This info is helpful and right on the money. Thanks for your feedback and so glad to hear what you say!